Charge your phone and your tablet simultaneously, while you’re in your car driving. This dual-port car charger features two USB 2.0 ports - one 1A port for charging your smartphone or iPhone and one 2.4A port for charging your iPad or other tablet. Plus, when you’re traveling with a passenger, having the second USB charge port available means that you can charge two phones simultaneously and ensure that both of your mobile devices are ready when you arrive. 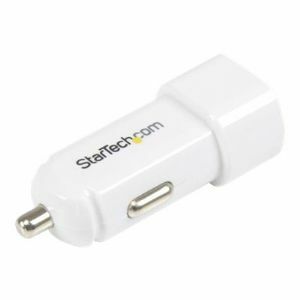 The durable USB2PCARWH white dual-port car charger is backed by StarTech.com's 2-year warranty to ensure dependable performance.